A rare overabundance of fish seems to be offsetting the balance of several ecosystems in Asian and North American Pacific waters. Pink salmon have recently surged in number, preying on enough ocean to increase their body masses by 500% in only a four month time period. In addition, over 640 million pink salmon returned to their breeding rivers in the North Pacific and Asia over the course of the last year. Since these fish are thriving, this phenomenon has inevitably thrown off the success of other animals. Seabirds that normally feed off of the same prey as pink salmon have been shown to steadily decrease in numbers during time periods in which the salmon are doing well. 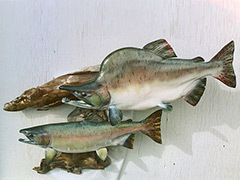 The drastic increase in pink salmon numbers can be attributed to rising temperatures in the Bering Sea and North Pacific, where experts say the increase in temperature raises both the success rate of the salmon’s prey, as well as the fish’s metabolism and thus their ability to eat more and grow larger. Little is known, however, on the exact effects climate change can have upon complex ecosystems, especially those underneath the water. The U.N.-commissioned Intergovernmental Panel on Climate Change report recently predicted that the warmer oceans could wreak havoc upon the populations of Atlantic cod and tuna. Interestingly, one of the proposed remedies for the pink salmon problem is to drastically increase the commercial catch numbers for the fish, thereby attempting to conserve the environment by eating wildlife - perhaps a reprehensible idea, but also a radical one. Posted on April 11th under Global Ecology.